Forgiveness refers to blotting out sin and guilt. After this happens, the person who did wrong can again be friends with the one whom they did the wrong to. All people sin against God. If they are to be friends with God and enjoy His love and kindness, they must be forgiven by God. Jesus said, "God does not forgive our sins unless we are willing to forgive one another." I started thinking about all the things that had made me bitter toward others, especially those that had wronged me down through the years. I couldn’t understand why it was so difficult for me to shake certain images out of my mind. I remember many years ago when I started crying out to God for true deliverance. As I prayed day after day, month after month and year after year seeking for answers to my problems, He gave me the solution. I would like to encourage you if there is bitterness in your heart toward anyone about anything it is time to forgive and let it go. If you do not it will slowly take a toll on you. It will make you feel like parasites are eating away every organ in your body at a slow pace. I am a living witness. Let it go . . .Be blessed! P.S. Tomorrow, we will talk about "Anger." You can order my book from the internet through: WestBow Press Publishing Company, Barnes and Nobles, Amazon.com, as well as other places. 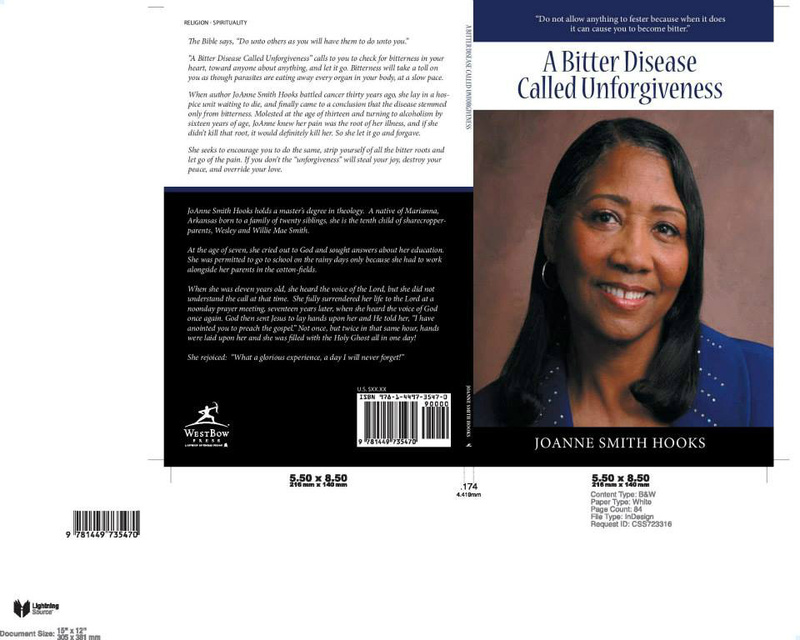 Excerpts from: "A Bitter Disease Called Unforgiveness"
This book can be read within 2 ½ to 3 hours if you are reading it non-stop. It is written for an age level of 9 to 99 based on parental guiding for children ages 9 – 17… It is a counseling tool for homes and different facilities such as; churches, doctor’s offices, hospitals, colleges, elementary – high schools, libraries, sober living quarters, transitional homes, etc…. These are true stories. Some of the names have been changed to protect the innocent. Chapter one talks about “Hidden Roots” - It deals with overcoming abuse, molestation and sickness, which cause bitterness. (I was molested at the age of 13). Chapter two deals with “A Touch of Humility” - It talks about how unforgiving spirits will prevent us from getting to heaven. Harboring un-forgiveness will only lead to bitterness and bitterness causes diseases…once we let these things go this is when healing and deliverance will take place in our lives. Chapter five deals with "Beautiful Painted Pictures" - It talks about when you have surrendered your life to the Lord and you are doing all the right things, thinking on pure and holy thoughts. Yet, Satan knows that you are still vulnerable and he sets a trap to pull you back in through your unsaved friends. Chapter six & seven deals with “From a Cocoon to A Butterfly” - These Chapters tell us how a great transformation will take place in our lives after we remove jealousy, envy and pride. Chapter eight talks about “Secrets Exposed” meaning (Evaluate your Secrets before exposing them) - This chapter gives you many secrets that have been exposed. Including a secret that I expose of myself that I carried for 43 long years. Chapter nine tells us, “There is a consequence for our Actions” – (That’s not nice! ): It talks about how the impact of our sins has affected our children lives and there is a consequence that we must pay as parents. It concludes with asking our children to forgive us as parents, as well as ending with a prayer to our children. Chapter ten deals with “How to Overcome Hurts” – I am sure every one of us can attest to this chapter, even a child. (This chapter is a must read). Chapter eleven & twelve concludes with a Message based on how “Your Faith is a terrible thing to Waste” – The conclusion of this chapter has a story about Faith and Hope meeting at a crossroad. Faith tells Hope to join him on the other side of the Jordan River because there are some people that he needs to talk with on the Riverbed and those folk are: Misery, Depression, Suicide and a Grieving Mother that lost her little girl to Molestation….